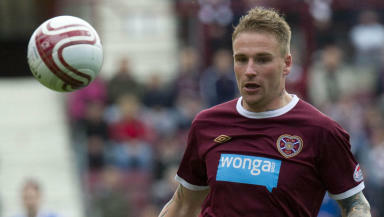 The forward walked out on Hearts in December and could make a shock return to the First Division. Ayr United are in talks with Hearts over a move for Ryan Stevenson. The forward, who moved to Tynecastle from the First Division club in 2010, is currently in self-imposed exile from Hearts in frustration at receiving his wages late for three successive months. Stevenson had a brief change of heart and was set to return to training with Paulo Sergio’s side. But, following a meeting last week, the 27-year-old decided against returning and remains unavailable for selection. Despite interest from other Scottish Premier League clubs and teams in the English Championship, Ayr are hoping to use additional investment from main sponsor Bodog to entice the player back to the club on a permanent basis. The Honest Men are due to face local rivals Kilmarnock in the semi-finals of the Co-operative Insurance Cup later in January. Stevenson is not cup-tied for the competition, having missed out on Hearts’ elimination at the hands of Ayr United, and would be free to play. Having played 22 times for Hearts this season, scoring four times, he was called into Craig Levein's Scotland squad for the friendly with Cyprus in November but didn't feature.